It all started with a bunch of kale and a sweatshirt. Last weekend my husband and I enjoyed a rare Saturday during which neither of us had work or social obligations beyond hanging out with one another. We ran some errands in the morning and decided to head to the Clark Park Farmers Market to meet my parents and enjoy some Honest Tom’s breakfast tacos (if you haven’t had them, head to Clark Park on Saturday mornings–you don’t know what you’re missing.) As we waited for our tacos, I started to get a little chilly and called my sister to ask her to bring me a sweatshirt (she lives a block from the park.) Shortly thereafter, Sophie showed up with a sweatshirt in tow and was rewarded with a steaming hot order of tacos–quid pro quo! As I pulled on the sweatshirt, I looked around the market and started thinking about shifting into some cold weather cooking. 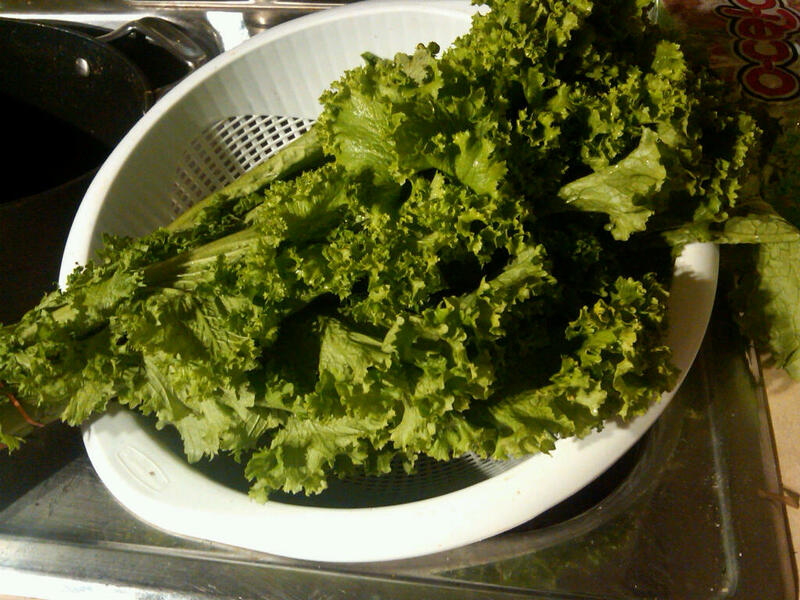 When we got back to my parents’ place, my mom pulled out a beautiful bunch of kale she had gotten from the CSA. My parents do not belong to a CSA, mind you. Much like me, they enjoy their weekly shopping adventures at the Reading Terminal and local markets–from Clark Park on Saturdays to the Indian store for Friday night samosas. Instead, they are occasionally gifted the leftovers from the CSA that their neighbors belong to. Once I had the kale in my possession, my head began to spin with possibilities. I knew I wanted some sort of soup and I remembered the Portugese potato, kale and chorizo soup. That sounds good, I thought to myself. 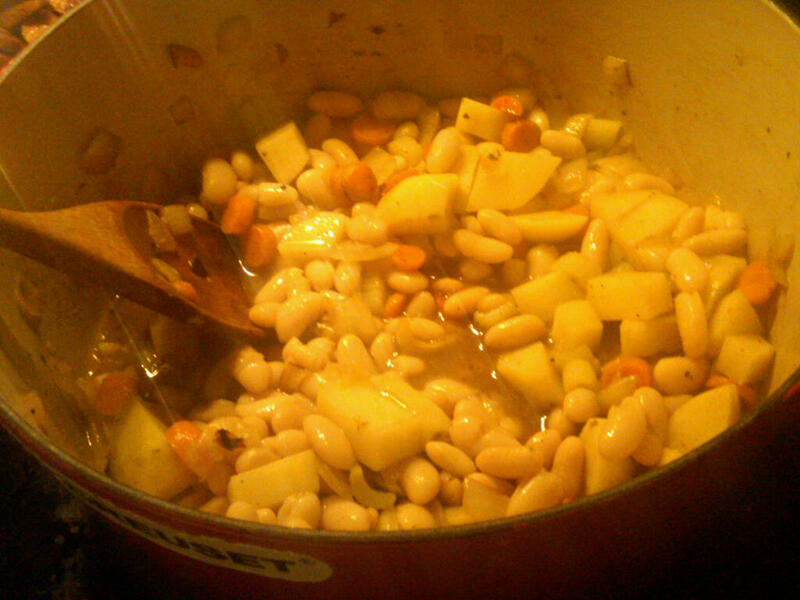 However, I wanted to alter it a bit with the addition of white beans. Where was I? I get SO carried away sometimes…oh right, the kale. Look at this kale!! Oh right, I added two potatoes and a bay leaf as well. 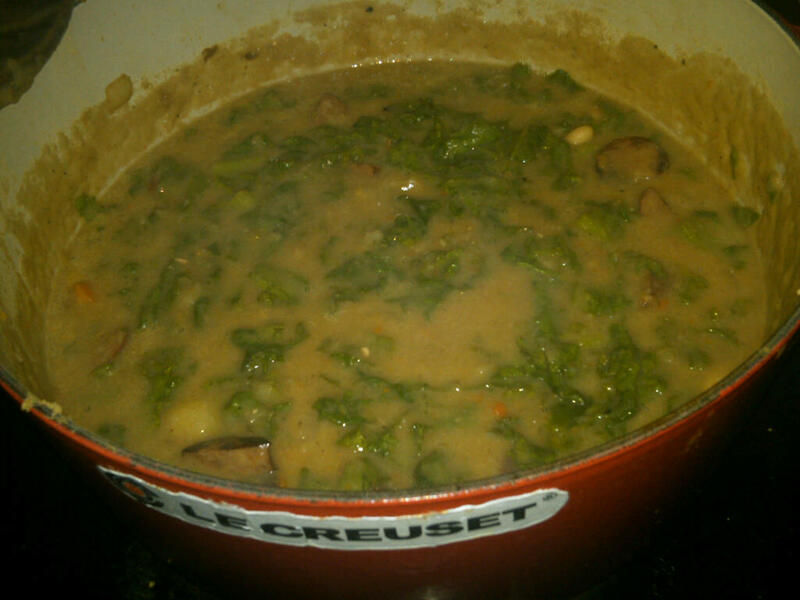 Once the mirepoix–well, I’m looking at the picture and it doesn’t look like I used celery, so…once the carrots and onions softened up a bit, I added two cans of white beans. I know, I know, I didn’t use dried. I just didn’t have the time. So there. 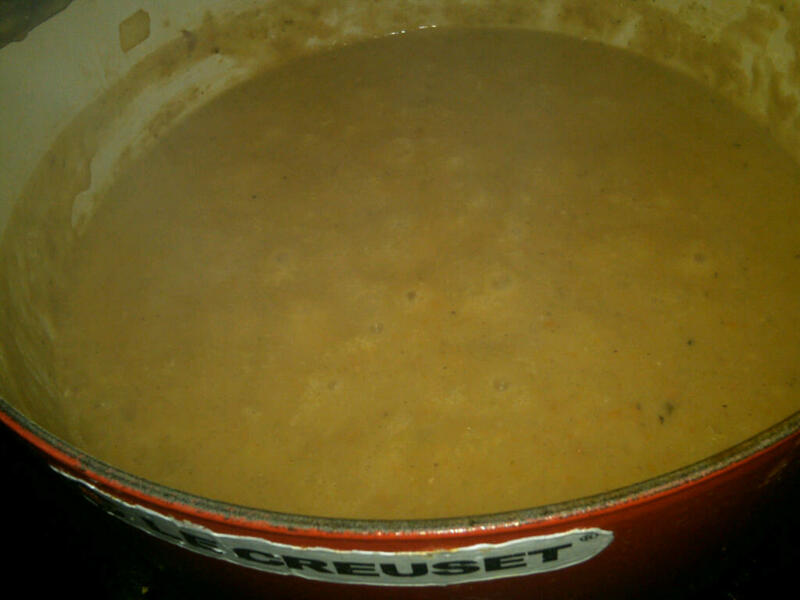 After the beans, I added about 3 cups of chicken stock and let the whole business simmer for a while. After it simmered for 20 minutes or so, I pulled out my trusty immersion blender–if you don’t have one of these, you MUST get one this moment–and blended the soup roughly. It was right about this time that I remembered that I had forgotten to remove the bay leaf. Ugh, now I’d be picking bay leaf chunks from the final product. Doesn’t that look yummy? 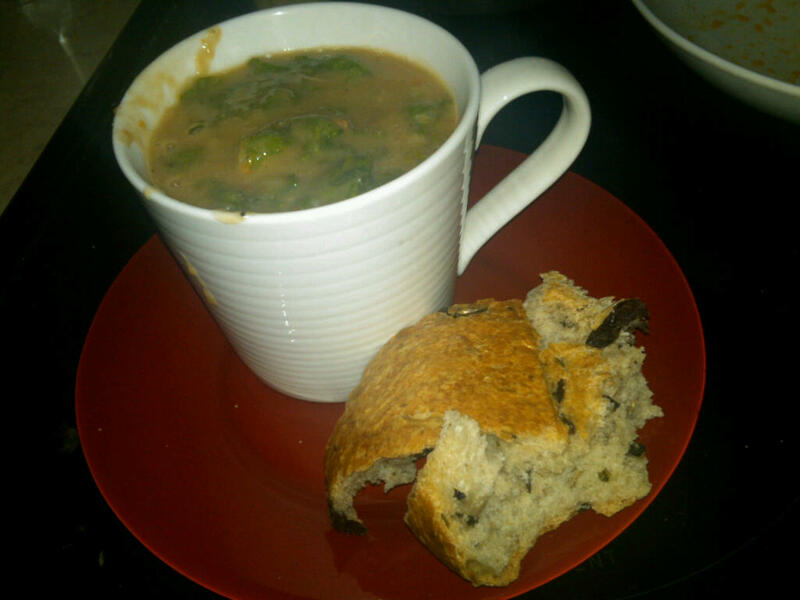 I could have stopped there for a simple, yet rustic, white bean soup. Instead, I forged ahead. 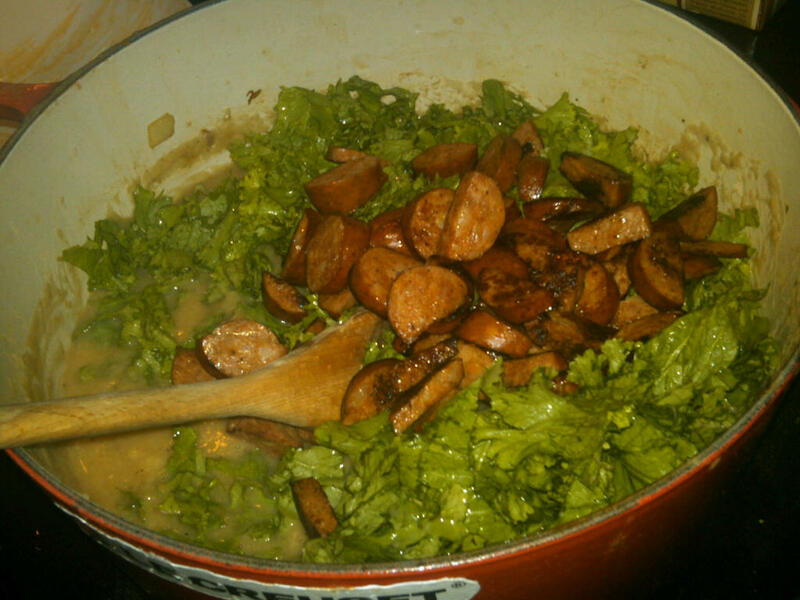 I added the chopped kale and chorizo to the mixture. I simmered for another 20 minutes or until the kale had cooked down sufficiently. I think I also thinned it out a bit more with some additional chicken stock. 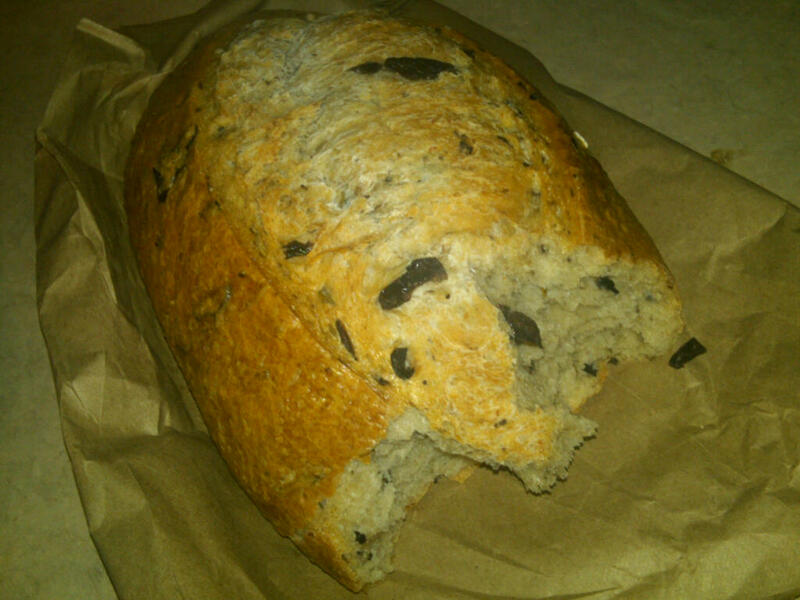 Once it was done, I served it with this phenomenal rosemary-olive loaf that I got from Four Worlds Bakery, this new spot in West Philly. 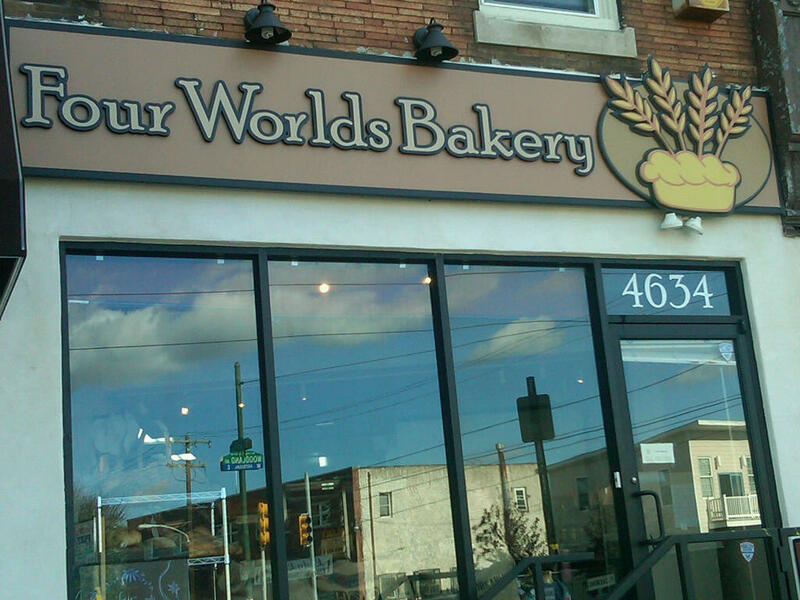 The bread was really good. So good, in fact, that my hungry husband couldn’t wait to dig in. Not to mention, it stayed nice and soft for a few days afterwards. I’ll definitely be adding this one to the repertoire. 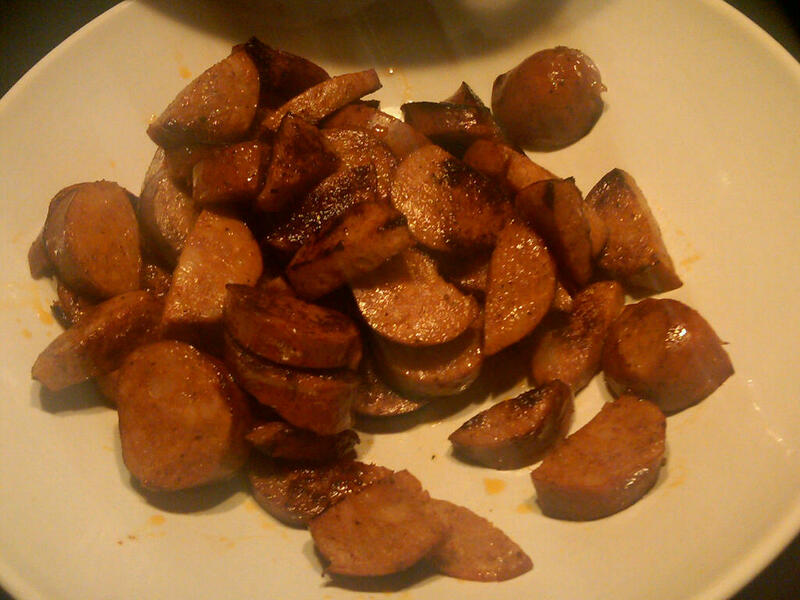 In fact, I made it again since the first time, with the addition of rutabaga and substituting andouille for chorizo. Let’s just say my husband liked the first one better. I think I did too.